John Tyre & Sons is a long established family business providing an extremely high standard of personal service. John Tyre & Sons was established just after the First World War by John Tyre Snr although his family had been blacksmiths for many years before that. The firm was mainly occupied with horseshoeing and repairing farm and forestry machinery at this time but as the century moved on he found himself working on major projects such as the new hydro power station at the Tarsan Dam using pioneering welding techniques. By this time he had been joined by his son, also John Tyre and the type of work widened to encompass Local Council, Electricity and Gas Board work. In the 1970's oil rigs were being built near Dunoon and many of their workforce worked round the clock carrying out skilled welding tasks. Each generation has seen changes to the type of work carried out and the current generation is no different. 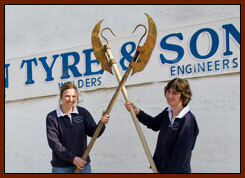 Scott Tyre is now the blacksmith over-seeing and working with his staff on projects as diverse as manufacturing large ornamental school gates and railings to a design hand drawn by the children themselves, to fabricating components for mechanical arms on a Scorpio Work Class Submarine. Of course, some things have always been part of their work like domestic gates and railings. Repairing farm and forestry equipment still goes on but now Guy Pate, Scott's brother-in-law runs the fully equipped garden machinery and small plant repair workshop together with an extensive plant and tool hire section and a large showroom selling quality machines, protective clothing and accessories to name but a few items.